IP SLA is a great feature if you want to add some automation and intelligence into the network. SLA is no SDN/OpenFlow, but it can be very useful. It can also take down a network. Let’s say you are using DMVPN for a number of spoke locations in your network. You have a primary Internet connection on the spoke using DSL or cable modem, and you have an air card for backup. You want to use IP SLA to monitor your spoke’s primary Internet connection: when it goes down, bring the air card online. Of course, when the primary Internet connection comes back online, you want to switch back over. Here are some of the configuration guides that I found on setting up IP SLA. This is not an extensive list, and none of these cover what this article is going to try to explain. But they are good references. This is a normal IP SLA configuration, correct? We ping 155.1.23.2 (assume it is my primary DMVPN hub) and if we get a response, the track 1 object is up, and we are using our primary Internet connection. If the ping fails, then the track 1 object goes down, and we use whatever mechanism to bring up the air card. What about something in the transit path that is dropping packets randomly? On a DMVPN solution, I would recommend monitoring one, if not all, of your DMVPN hubs’ public IPs. That should improve stability. But what if something in the path is dropping some packets randomly to both hubs? It could be a link with errors, congestion, etc. It could happen – I have seen it. So, the first polling interval the ICMP response is good and track 1 is up. The next polling interval the ICMP packet is lost, so our primary Internet connection is ‘down’ and we failover to the air card, re-establish our DMVPN tunnels, the routing protocol forms adjacencies, routes are exchanged, and data starts flowing again. Great! During the next polling interval, we get a response along our primary Internet connection path, so we fail back over to primary, re-establish tunnels, the routing protocol forms adjacencies, routes are exchanged, and data starts flowing. Next interval fail. Next interval response, fail, response… Now something in the transit path has just completely brought down our spoke, or spokes. Should we really failover just because we lost a single ping? TCP/IP was designed to recover from packet loss, so there is a good probability this path experiencing packet loss still has a better user experience than moving to the air card. This allows the probe three chances to get a response on the primary Internet path before failing over. Likewise, when the primary connection comes back up, it must be stable for 3 polling intervals, or 90 seconds. 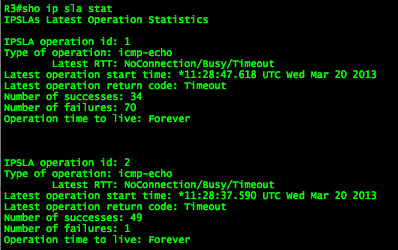 This interval is similar to routing protocols timeout/hold timer methods. Let’s take a look at it in action. Here we see the endpoint is responding to the ICMP probe and the tracked state is up. Now let’s take that endpoint down and see how the tracked object responds. So now our probe is showing timeout. Our tracked object is still show up, but it also has a delayed down of 82 seconds remaining. Now, I will restore connectivity before down timer expires on the tracked object. I restored the connectivity before the timer on the tracked object expired. The last state change was 9 minutes and 31 seconds ago. Since it never transitioned to the down state, we never failed over. Our probe now has a little wiggle room to allow for some packet loss. This will help us prevent outages caused by failing back and forth constantly due to a single packet loss somewhere in the transit path. You may notice that at the bottom of the ‘show track 1’ output there is a line that states ‘Track-list 3’. I setup to two ICMP probes, both tracked. Then I created another tracked object list that tracks the first two. Why? Because I want to monitor both DMVPN hubs. Only if I can’t reach both of them after 3 polling intervals do I want to failover to the air card. So let’s bring down probe 1. There we are. Tracked object 1 is down, tracked object 2 is up, but the object that monitors both of them is showing that we still having connectivity to at least one of them. This also will allow me to perform maintenance on one of the hubs and not causing all of the spokes to jump over to their air cards. For completeness, we will bring down the second IP SLA and verify that tracked object 3 goes down. As expected when both probes go down, it causes both tracked objects (1 & 2) to go down, causing our tracked object list 3 to go down. And now we fail over. When at least one of the ICMP probes comes back up for 90 seconds, then tracked object 3 will come back up and we will fail back over to the primary Internet connection. Since you have made it this far, you must be interested in this, so I will give you my entire IP SLA config. You can use tracked object 3 with a static route or EEM script to affect the actual failover event. It is also possible to put delays on the combined tracked object or state that a certain tracked object NOT be up. What I miss, I have the OID for the ip sla last trigger result, what I don’t have is the OID for the track object, do you know which on it is? I have not looked into SNMP monitoring of the tracked objects. I did see a trap notification for tracked objects, but didn’t see anything that could be polled. With that being said, I was looking for something else and not specifically looking for tracked object OIDs. What are you wanting to do with the tracked object? Just get an email alert? Your monitoring system detected the tracked object going down? Sometimes just allowing the routing protocol to converge the network is simple and easy. In the case of the scenario that brought up this issue is that the client was failing over to an Air Card which has much less bandwidth. There is an EEM script that is also monitoring the tracked object and when the tracked object goes down, only then does the Air Card come up. Then the EEM script shuts down non-critical services such as guest WiFi. Thanks for the feedback. Sweet! Just what I needed to read. Thanks for the explanation on the “delay down/up” config. 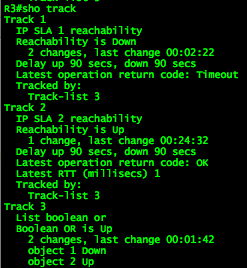 I have a IP SLA track and it was too sensitive, this delay threshold resolved my problem. Wow, I have an ip sla down/up issue for a long time, this article is awsome. Thanks for sharing.